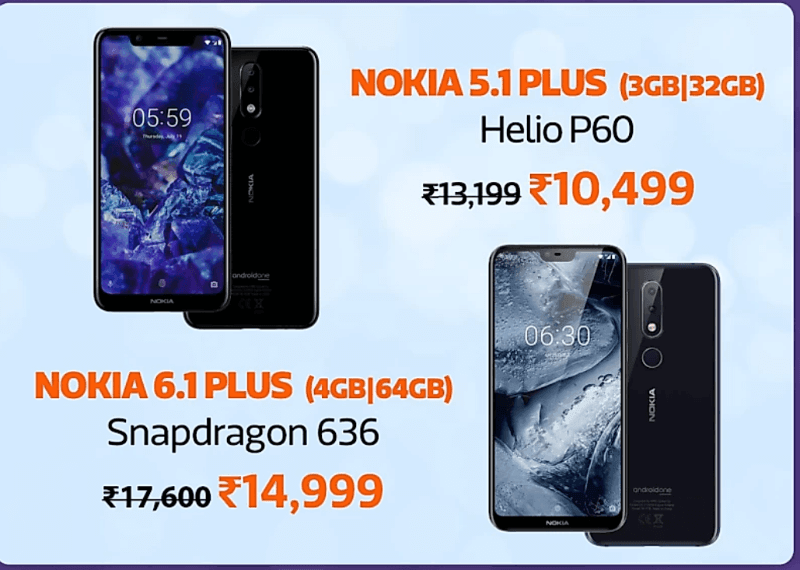 Ahead of the much-awaited festive season, HMD Global has slashed the prices of its latest Android One devices, the Nokia 6.1 Plus and Nokia 5.1 Plus. Both the smartphones received a considerable amount of price cut, and they’ll be available at Rs 14,999 and Rs 10,499 during Flipkart Big Billion Days, which will commence on October 10. The Nokia 6.1 Plus has received a price cut of Rs 2,000, while the Nokia 5.1 Plus got a Rs 500 reduction in its launch price of Rs 10,999. E-commerce giant, Flipkart revealed these prices on its portal stating the price will be down only for a limited period during the sale days. Nokia 6.1 Plus at Rs 14,999: Should You Buy it? If you’re in the market for a compact and powerful smartphone unlike the Xiaomi Redmi Note 5 Pro, Realme 2 Pro and Motorola One Power, then you should definitely check out the Nokia 6.1 Plus at Rs 14,999. At the moment, it’s unknown whether the HDFC 10% discount is valid on the Nokia 6.1 Plus or not. If the offer is valid, then the phone will even come down by at least Rs 1000, which makes it one of the worthy smartphones to purchase during the festive season. Pros of Nokia 6.1 Plus? First of all, the Nokia 6.1 Plus is a good-looking and compact smartphone available in the sub-Rs 15,000 price point. It sports a 5.84-inch Full HD+ display with 19:9 aspect ratio, which has decent viewing angles and brightness levels. Under the hood, it has the Qualcomm Snapdragon 636 chipset, clubbed with 4GB of RAM and 64GB of internal storage. Coupled with stock Android 8.1 Oreo, the phone delivers excellent performance; Even the PUBG Mobile gameplay was good in low graphics setting. Now coming to the biggest USP of Nokia 6.1 Plus or any other Nokia smartphone, it’s the software. Just a couple of weeks ago, HMD Global confirmed that the Nokia 6.1 Plus and Nokia 6.1 would get Android 9 Pie this month itself. So, if you want to enjoy the latest iteration of Android ahead of others, then again, the Nokia 6.1 Plus should be your first choice. The Nokia 6.1 Plus has some cons too with the major one being the cameras. The rear cameras on the Nokia 6.1 Plus won’t match the cameras on the Redmi Note 5 Pro, but they’re on par with Motorola One Power. The selfie camera is an acceptable one though. Another area where the 6.1 Plus suffers is in the battery life department. The 3060mAh battery will last for a full day on Wi-Fi, but if you use it on 4G, then you’ve to charge it by the end of the day itself. HMD Global even discounted the Nokia 5.1 Plus which went on for sale in India on once. The smartphone, originally priced at Rs 10,999, can be picked up for Rs 10,499. For the asking price, it sports a 5.84-inch HD+ display, MediaTek Helio P60 chipset, 3GB of RAM, 32GB of storage, possibly the best design in its price range and more importantly, it comes with stock Android. Samsung J7 pro, A7 2017 are far more better than the crap HMD 6.1 plus. Which cpu is used in crapsung’s j7 pro and A7 2017??? Did they stand against SD 636? ?